WOW! This dish is amazing! One evening we were watching Diners, Drive-ins and Dives when Guy Fieri went to Austin, Texas to eat at a sandwich shop called the Noble Pig. One of the dishes they fixed was a duck pastrami sandwich. Now, I absolutely adore pastrami. It may very well be my favorite sandwich meat and I have even been known to eat it for dinner like one would eat corned beef (Inasmuch as both are brined meats, it should come as no surprise). Also, I really like duck. It’s such a rich, succulent meat. I have fixed it countless ways and always enjoy it. Here, someone combined two of my favorite flavor profiles into an extraordinary treat. As such, I was highly intrigued and fascinated by the concept of duck pastrami. I had to have it no question about it. So the search began. I scoured the internet looking at scores of recipes. Emeril has one, as does Michael Symon. Then, other people have their version, as well. I gleaned as much information as I could covering ingredients and technique also relying upon my past experience in making pastrami. While all of them looked good, nothing really caught my attention and said EAT THIS! So I pondered the reality of duck pastrami for several weeks. I then went out and scoured the world wide web for basic pastrami recipes looking for something exciting. It was then I was inspired and this recipe is the result. This is one of the most flavor packed dishes I have ever come up with. The duck is tender, succulent, sweet, smokey, salty and peppery. There is a lot going on. Again, WOW! If you want to try something that will flat out amaze you, give this recipe a try. Just make sure to make a double batch because it’s sooooo easy to eat in one night. We did and now I have to make some more. 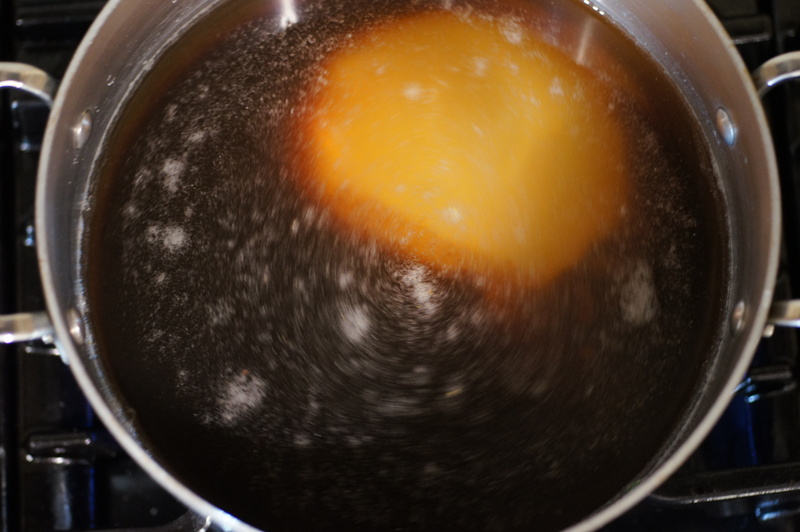 In a saucepan combine the water, brown sugar and salt. Bring to a boil and stir to dissolve the sugar and salt. 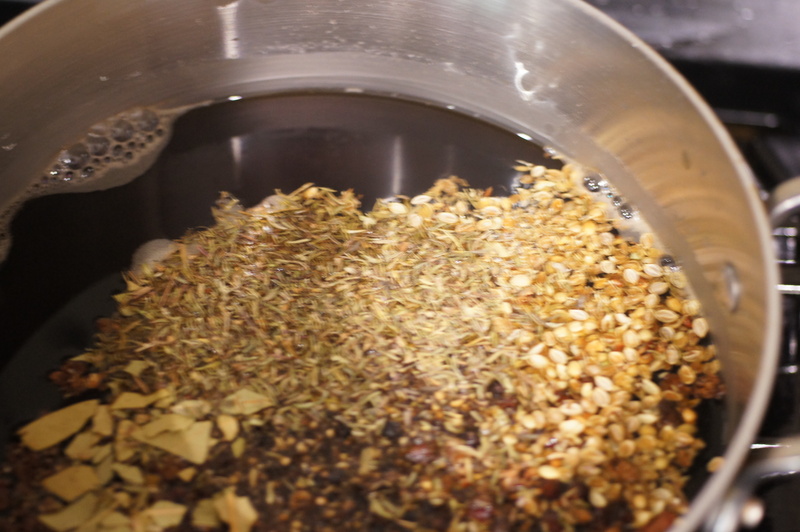 Remove from the heat, add spice mixture, and steep for 1 hour. 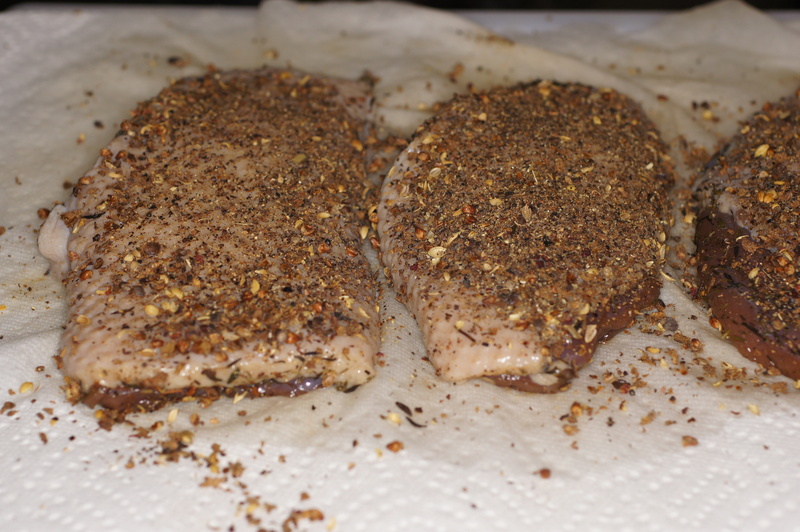 Place the duck breasts in a glass or plastic container or a plastic bag. Pour the seasoned brine over the duck to cover completely and seal. In my case, I used a plastic bag and sealed it in the chamber vacuum sealer. Let sit for 48 hours. After 48 hours, remove from brine and pat dry. Prepare rub and rub into flesh and skin pressing hard to make sure it really is rubbed in. 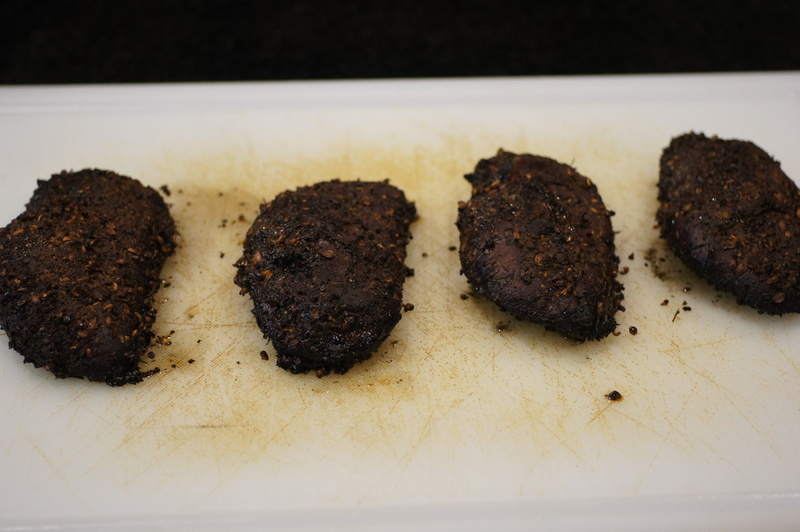 Heat a smoker or your oven to 250 F. Place the duck breasts in the smoker skin side down. Slow smoke or roast the duck for 3 hours at 250 F. After 3 hours remove from smoker/oven and let rest until cool. When cool, wrap tightly in plastic wrap, refrigerate for 1 week. 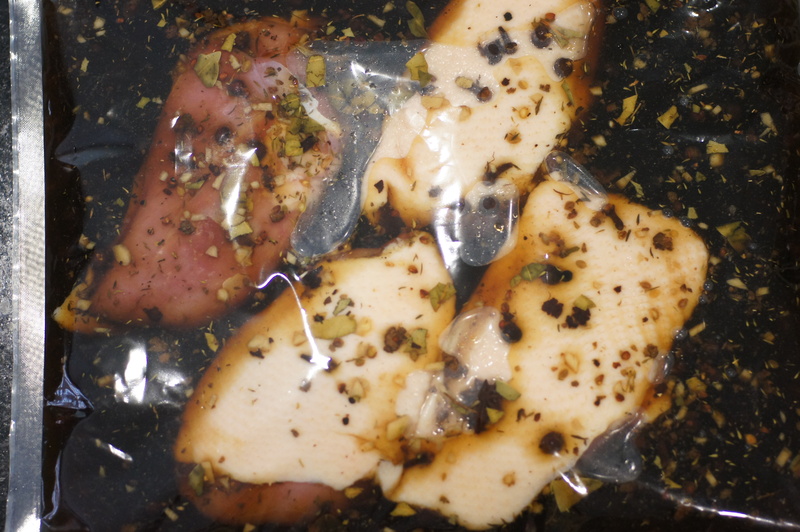 I again used the chamber vacuum sealer on medium pressure and sealed the breasts. After we vacuum sealed the bag we left for Portland, Me. for my 58th birthday and to see our youngest son, fka Knothead, nka Stickin’ Genius. We got back September 2 and had this for lunch on September 3. It was great! To serve, remove the meat from the plastic wrap and slice thinly. Serve with various accompaniments as appetizers or hors d’oeuvres. Alternatively, it makes one hell of a sandwich dressed just like a Ruben but with the duck pastrami instead of the corn beef. Wow! Richard this looks fantastic. 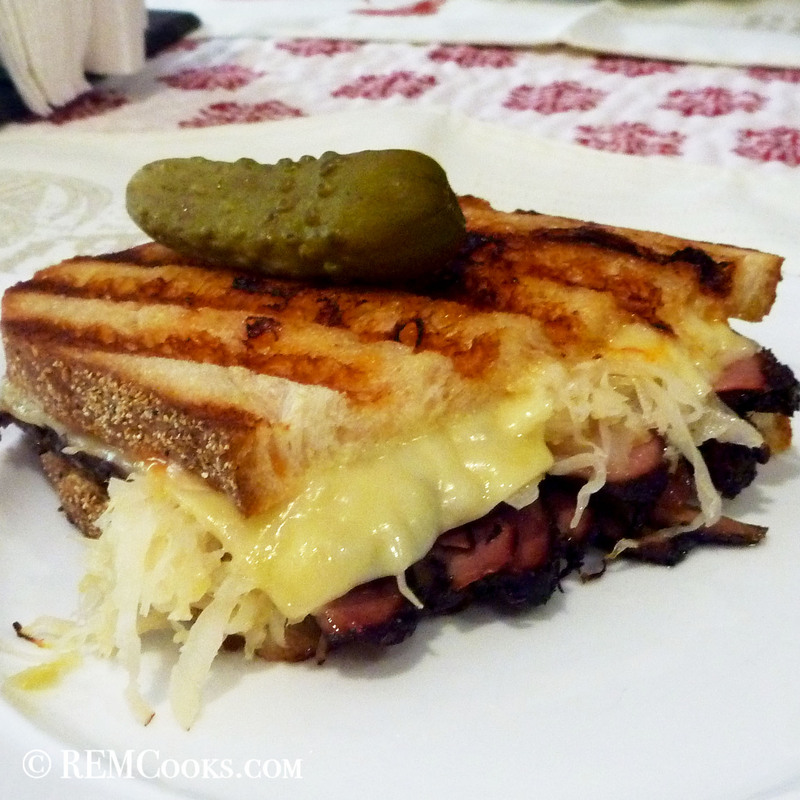 And that Rueben is talking to me. It’s my favorite sandwich and yours looks darn good! This is one recipe, though, I must pass on. My smoker is out of commission and won’t be replaced. 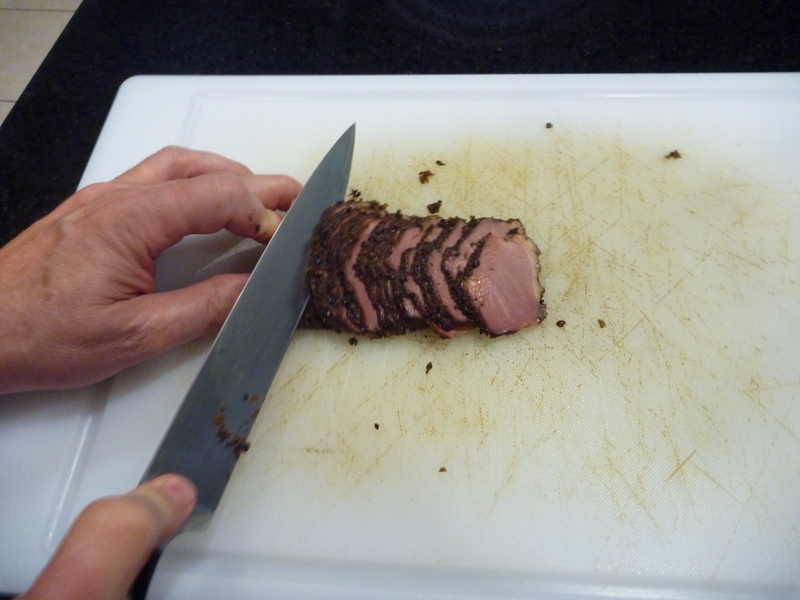 Alas, I’ll have to enjoy duck pastrami vicariously through your posts. You wouldn’t happen to deliver, would you? A lot of thought went into this recipe. It looks great, and I especially appreciate the wood smoke. Brine, smoke, and refrigerate. I suppose the vacuum sealing necessitates a slightly longer refrigeration at the final step, given the slightly reduced pressure in the bags? Not really. I’m playing with the new toy. 🙂 You simply want it to sit for a few days (3 – 7) in plastic wrap and allow all the flavors to meld. That is a very interesting choice of meat. We made pastrami last year, I bought the traditional brisket ( which I will never waste my money on again, not lean enough for me ) , and brined it for 2 weeks, babysitting it and turning it every day. We do not have a smoker, so I found a way to cheat and do it in the oven with layers and layers of tin foil 7 to be exact and lots of spices, smoked paprika etc. The outcome was pretty good, but did not outweigh the effort, so I will make it again only brine for less time, and use different meats. Not sure if duck is available fresh here, but I heard there is a farm not far with buffalo and wild game, so will check it out. I see you use a vacuum sealer , that too is another thing I’ve been thinking about getting , do you have any input on that ? I’ve been using ziplock bags and the old straw method lol. The duck meat was perfect for this dish and we loved it. We really did eat it in one day. 2 weeks is a really long time to brine, even a whole brisket. I’ve done it before and found the meat to be too salty for my taste. For a whole brisket, I stop brining after 5 days and find it much more tasty. Insofar as the brisket is concerned, rather than buy a whole brisket, buy the “flat half,” often referred to as first cut. It’s less fatty and is often the most popular for making braised beef brisket. 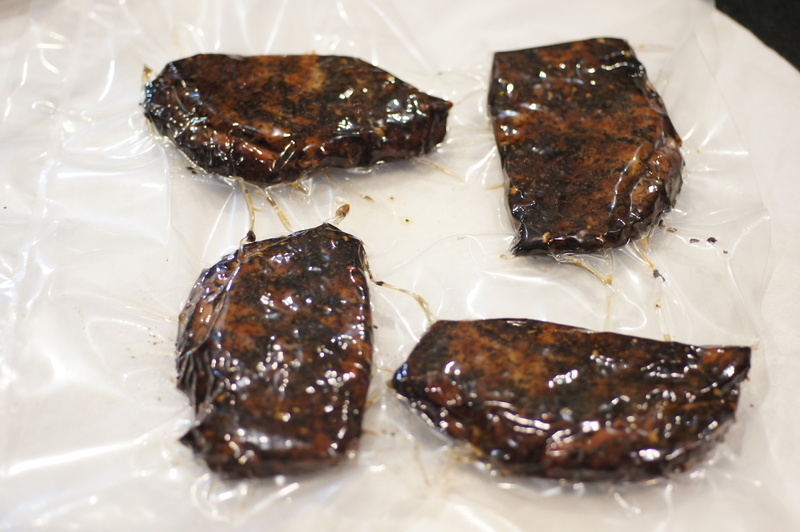 As for the chamber vacuum sealer, I love mine. It’s a Vacmaster VP112 Chamber Vacuum Sealer. You can find it through the Webstaurant Store for $559 with free shipping. Of course, you can simply use it to store and freeze foods. Because it is a chamber vacuum sealer, you can vacuum seal chili, stews, soups, etc. Oh, and 1 last point, it’s rather large at 50 lbs and 16″W x 24″D x 9″H. I had the counter space so it’s fine for me. Otherwise it is a chore to move around. That’s very interesting. Nice blog. Thanks for dropping by and your nice comment. You should give this recipe a try. It really is great! I am late to the party, but just discovered your blog via Pinterest. This looks AMAZING. I don’t have a smoker, but I think I might try it out in the oven anyway. 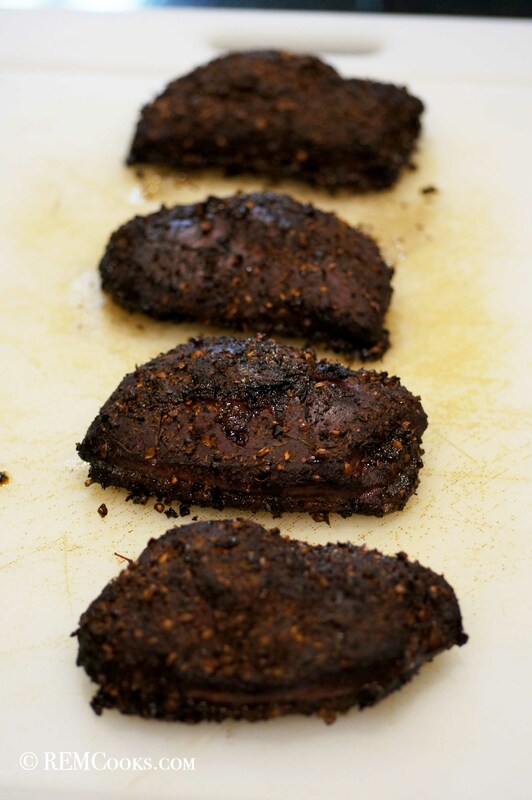 Duck and pastrami are some of my favorite foods- you’ve blown my mind with this recipe!! Thanks for your very nice compliment. We’re glad you found us and like they say “Better late then never.” 🙂 I’m sure this will be flavorful in the oven but the smoke flavor really takes this over the top. Have you thought about a stove top smoker??? 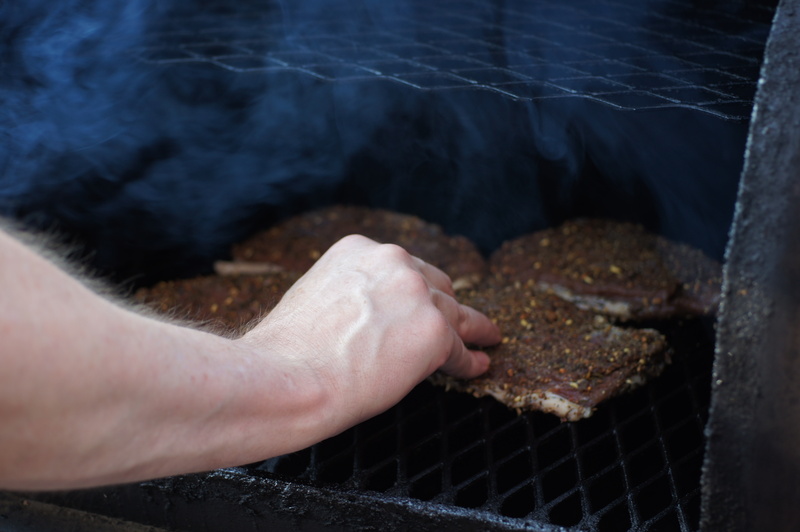 You also can use a regular grill with the duck off to the side and soaked wood chips on hot coals to provide the smoke. The trick will be regulating the temperature. I’m making this! Thanks Richard. Doing this on my Weber with pecan smoke for a thanksgiving appetizer. Thanks. You will love it. It’s one of my favorite recipes. I just had a duck breast pastrami today at a pub in Eugene Oregon. Phenomenal!! I immediately came home and searched Google for a recipe. I came across yours and am look forward to trying this. HinRichard, I commented here August 1 having found your recipe for duck pastrami. My husband and I made this finally and we really enjoyed it. He has the cooking education so with the price of duck breasts I left the recipe in his hands. With persistent pestering I finally got my homemade duck breast pastrami sandwich. The recipe is spot on!! Thank you for bridging the gap between restaurant and home and bringing this dish into our home. The duck breast thinly sliced on a meat platter for a special occasion with some delicious cheese.